Do you have a question about numerology? Use this form to ask Numerologist Hans Decoz. How about the interpretation for numbers higher than 99? Like 104 and 124. Multi-digit numbers generally are reduced to single-digit numbers, unless they add to a Master number. (There are three Master numbers, 11, 22, and 33. You can learn more about Master numbers here…) They are interpreted based on their single-digit value. However, sometimes we want to take a closer look at a multi-digit number, for example when we wish to analyze a calendar year in order to forecast its influence. I recently wrote a forecast for 2019 and in order to get a detailed, in-depth look, I analyze the whole number, but even then, the dominating influence is the single-digit to which it is reduced. Reduce it to a single digit and note its meaning. In 2019, that would be 2+0+1+9=12, which further reduces to 3 (1+2). Note the meaning of each individual digit that makes up the number. 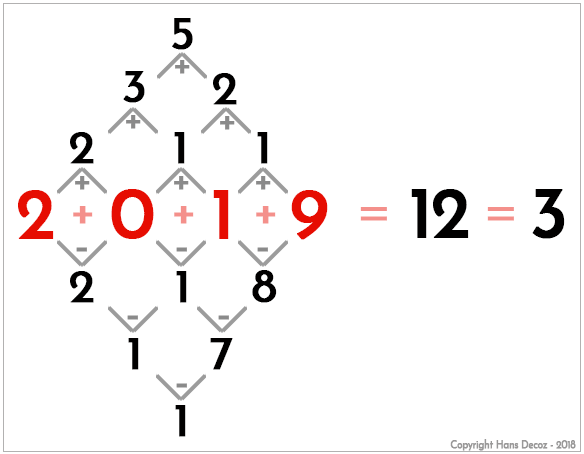 In the case of 2019, we consider the 2, the 0, the 1, and the 9. Think of them as the flavors that make up the 3 single-digit total. Use a pyramid-like formula to find the Pinnacles. See the image below. The Pinnacles reveal an important influence for specific periods; the First Pinnacle covers approximately the first 1/3rd of the time period – in this case a year; the Second Pinnacle and the Third Pinnacle cover the middle 1/3rd, while the Fourth Pinnacle dominates the last 1/3rd of the year. Use the inverted pyramid-like formula deducting the larger from the smaller to find the Challenges. 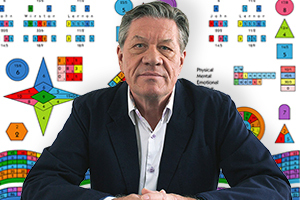 I would like to do your online numerology course. I was able to access it yesterday but not today. Please advise. My understanding is that there is no extra fee? Thank you for your interest in numerology. The course is indeed free. I don’t know why you couldn’t access it today. Perhaps there was an issue with the Internet connection, or the URL was incorrect. Here’s the link to the course. I'm wondering how a different language/alphabet impacts the numerology results. I'm Slovene, and our alphabet is different from english, yet through the course of my life I've mostly referred to English interpretations. I realize the meaning of the numbers is the same, they're just derived from different letters. Also, will you enable customizable alphabet in your application? A future update of our app will include that option, but again, the user will have to select the letters and their values. Considering that the user is fluid in that language, it shouldn’t be too hard. Birth data details are removed to ensure your privacy. We generally only include the first name and month of birth. You can also specify your preferences in Hans' response to your question.